If you wish to contribute, joining the #typo3-cms-coredev channel in the TYPO3 slack workspace is recommended as it is the projects chosen platform for communication. It is mandatory to create a typo3.org account, before you can join the TYPO3 Slack workspace. In order to join the slack workspace, you must already have your typo3.org account. Got to Slack for TYPO3 on my.typo3.org. On that page, you will also find information about recommended channels. 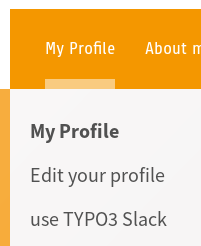 Login with your typo3.org account, then go to the "My Profile" tab and select "Use TYPO3 Slack". including clicking on the link in the welcome email with subject "Stefan Busemann has invited you to join a Slack workspace" from slack. See Appendix: Slack for more information on Slack.